The next day after the stoning of Paul, the apostles left the city, according to the direction of Christ: "When they persecute you in this city, flee ye into another." They departed for Derbe, where their labors were blessed, and many souls were led to embrace the truth. But both Paul and Barnabas returned again to visit Antioch, Iconium, and Lystra, the fields of labor where they had met such opposition and persecution. In all those places were many that believed the truth; and the apostles felt it their duty to strengthen and encourage their brethren who were exposed to reproach and bitter opposition. They were determined to securely bind off the [p. 63] work which they had done, that it might not ravel out. Churches were organized in the places mentioned, elders appointed in each church, and the proper order established there. Paul and Barnabas soon after returned to Antioch in Syria, where they again labored for some time; and many Gentiles there embraced the doctrine of Christ. But certain Jews from Judea raised a general consternation among the believing Gentiles by agitating the question of circumcision. They asserted with great assurance, that none could be saved without being circumcised and keeping the entire ceremonial law. This was an important question, and one which affected the church in a very great degree. Paul and Barnabas met it with promptness, and opposed introducing the subject to the Gentiles. They were opposed in this by the believing Jews of Antioch, who favored the position of those from Judea. The matter resulted in much discussion and want of harmony in the church, until finally the church of Antioch, apprehending that a division among them would occur from any further discussion of the question, decided to send Paul and Barnabas, together with some responsible men of Antioch, to Jerusalem, to lay the matter before the apostles and elders. There they were to meet delegates from the different churches, and those who had come to attend the approaching annual festivals. Meanwhile all controversy was to cease until a final decision should be made by the responsible men of the church. This decision was then to be universally accepted by the various churches throughout the country. The apostles, in making their way to [p. 64] Jerusalem, called upon the brethren of the cities through which they passed, and encouraged them by relating their experience in the work of God, and the conversion of the Gentiles to the faith. 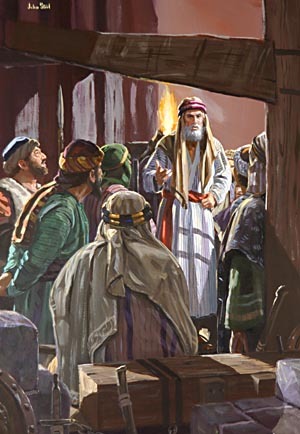 Upon arriving at Jerusalem, the delegates from Antioch related before the assembly of the churches the success that had attended the ministry with them, and the confusion that had resulted from the fact that certain converted Pharisees declared that the Gentile converts must be circumcised and keep the law of Moses in order to be saved. The Jews were not generally prepared to move as fast as the providence of God opened the way. It was evident to them from the result of the apostles' labors among the Gentiles, that the converts among the latter people would far exceed the Jewish converts; and that if the restrictions and ceremonies of the Jewish law were not made obligatory upon their accepting the faith of Christ, the national peculiarities of the Jews, which kept them distinct from all other people, would finally disappear from among those who embraced the gospel truths. The Jews had prided themselves upon their divinely appointed services; and they concluded that as God once specified the Hebrew manner of worship, it was impossible that he should ever authorize a change in any of its specifications. They decided that Christianity must connect itself with the Jewish laws and ceremonies. They were slow to discern to the end of that which had been abolished by the death of Christ, and to perceive that all their sacrificial offerings had but prefigured the death of the Son of God, in which type had met its antitype rendering [p. 65] valueless the divinely appointed ceremonies and sacrifices of the Jewish religion. The question of circumcision was warmly discussed in the assembly. The Gentile converts lived in a community of idolaters. Sacrifices and offerings were made to senseless idols, by these ignorant and superstitious people. The priests of these gods carried on an extensive merchandise with the offerings brought to them; and the Jews feared that the Gentile converts would bring Christianity into disrepute by purchasing those things which had been offered to idols, and thereby sanctioning, in some measure, an idolatrous worship. Also, the Gentiles were accustomed to eat the flesh of animals that had been strangled; while the Jews had been divinely instructed with regard to the food they should use. They were particular, in killing beasts, that the blood should flow from the body, else it was not regarded as [p. 66] healthful meat. God had given these injunctions to the Jews for the purpose of preserving their health and strength. The Jews considered it sinful to use blood as an article of diet. They considered that the blood was the life; and that the shedding of blood was in consequence of sin. The questions thus brought under the consideration of the council seemed to present insurmountable difficulties, viewed in whatever light. But the Holy Ghost had, in reality, already settled [p. 67] this problem, upon the decision of which depended the prosperity, and even the existence, of the Christian church. Grace, wisdom, and sanctified judgment were given to the apostles to decide the vexed question. He related the plain interpretation of these words, which was given to him almost immediately in his summons to go to the Gentile centurion, and instruct him in the faith of Christ. This message showed that God was no respecter of persons, but accepted and acknowledged those who feared him, and worked righteousness. Peter told of his astonishment, when, in speaking the words of truth to the Gentiles, he witnessed the Holy Spirit take possession of his hearers, both Jews and Gentiles. The same light and glory that was reflected upon the circumcised Jews, shone also upon the countenances of the uncircumcised Gentiles. This was the warning of God that he should not regard the one as inferior to the other; for the blood of Jesus Christ could cleanse from all uncleanness. Peter had reasoned once before, in like manner, with his brethren, concerning the conversion of Cornelius and his friends, and his fellowship with them. On that occasion he had related how [p. 68] the Holy Ghost fell on them, and had said, "Forasmuch then as God gave them the like gift as he did unto us, who believed on the Lord Jesus Christ, what was I that I could withstand God?" Now, with equal fervor and force, he said, "God, which knoweth the hearts, bare them witness, giving them the Holy Ghost, even as he did unto us, and put no difference between us and them, purifying their hearts by faith. Now, therefore, why tempt ye God, to put a yoke upon the neck of the disciples, which neither our fathers nor we were able to bear?" This yoke was not the law of ten commandments, as those who oppose the binding claim of the law assert; but Peter referred to the law of ceremonies, which was made null and void by the crucifixion of Christ. This address of Peter brought the assembly to a point where they could listen with reason to Paul and Barnabas, who related their experience in working among the Gentiles. "Then all the multitude kept silence, and gave audience to Barnabas and Paul, declaring what miracles and wonders God had wrought among the Gentiles by them." This ended the discussion. In this instance we have a refutation of the doctrine held by the Roman Catholic Church—that Peter was the head of the church. Those who, as popes, have claimed to be his successors, have no foundation for their pretensions. Nothing in the life of Peter gives sanction to those pretended claims. If the professed successors of Peter had imitated his example, they would have taken no authoritative position, but one on an equality with that of their brethren. Paul and Barnabas were recommended to them [p. 70] as men who had hazarded their lives for the Lord. Judas and Silas were sent with these apostles to declare to the Gentiles, by word of mouth, the decision of the council: "For it seemed good to the Holy Ghost, and to us, to lay upon you no greater burden than these necessary things; that ye abstain from meats offered to idols, and from blood, and from things strangled, and from fornication; from which if ye keep yourselves, ye shall do well." The four servants of God were sent to Antioch with the epistle and message, which put an end to all controversy; for it was the voice of the highest authority upon earth. The entire body of Christians were not called to vote upon the question. The apostles and elders—men of influence and judgment—framed and issued the decree, which was thereupon generally accepted by the Christian churches. All were not pleased, however, with this decision; there was a faction of false brethren who assumed to engage in a work on their own responsibility. They indulged in murmuring and fault-finding, proposing new plans, and seeking to pull down the work of the experienced [p. 71] men whom God had ordained to teach the doctrine of Christ. The church has had such obstacles to meet from the first, and will ever have them to the close of time. When Peter, at a later date, visited Antioch, he acted in accordance with the light given him from Heaven, and the decision of the council. He overcame his natural prejudice so far as to sit at table with the Gentile converts. But when certain Jews who were most zealous for the ceremonial law came from Jerusalem, he changed his deportment toward the converts from paganism in so marked a degree that it left a most painful impression upon their minds. Quite a number followed Peter's example. Even Barnabas was influenced by the injudicious course of the apostle; and a division was threatened in the church. But Paul, who saw the wrong done the church [p. 72] through the double part acted by Peter, openly rebuked him for thus disguising his true sentiments. Peter saw the error into which he had fallen, and immediately set about repairing it as far as possible. God, who knoweth the end from the beginning, permitted Peter to exhibit this weakness of character, in order that he might see that there was nothing in himself whereof he might boast. God also saw that in time to come some would be so deluded as to claim for Peter and his pretended successors, exalted prerogatives which belong only to God; and this history of the apostle's weakness was to remain as a proof of his human fallibility, and of the fact that he stood in no way above the level of the other apostles. Click here to read the next chapter: "Imprisonment of Paul and Silas"